Clumping litter makes urine cleanup easier than non-clumping litter does. You and your furry friend have plenty of litter options, so they're worth researching to make an informed decision. Comparing clumping and non-clumping litters is a sensible place to start. Clumping litters claim about 70 percent of the market, probably mostly because they're easier to clean up with. There's really no practical difference between how clumping and non-clumping litters fare with your kitty's solid waste. But clumping litters contain your cat's pee in a convenient lump that's easily removed from the litter box. The clumpability comes from natural characteristics of the litter material, bentonite; when wet the pieces stick together; the urine becoming the bonding agent. You should really clean out urine and feces from a litter box daily, and clumping litters definitely make the chore easier. Liquid waste in a box with non-clumping litter will trickle to the bottom; requiring digging, scooping and cleaning of the barrier. Clumping and non-clumping litters effectively help control odor, with or without scents -- which actually only mask smell rather than absorb them. Non-clumping litters date to the 1940s. Typically made of clay, they coat droppings and absorb urine to some extent, containing natural waste odor. Once non-clumping litters become saturated, they stop working, and urine pools in the litter box. If you're not proactive about litter box cleaning, your kitty's poop and the ammonia from her urine will start smelling no matter what litter you use. One of the key decisions kitty litter consumers face is whether to go for a scented or unscented product. Both clumping and non-clumping litters come in many varieties of scents. Scented may seem appealing, since you figure you won't have to smell your four-legged friend's leavings, but most veterinarians advise against using scented litters, notes WebMD, which goes on to explain that cats often find scented products overwhelming anyway. A disagreeable-enough fragrance may even prompt your kitty to find her own place to go. A sprinkle of baking soda in the litter is an effective option for odor control that won't bug your fastidious feline. Most health concerns -- founded and unfounded -- surrounding cat litters relate to dust inhalation. Both clumping and non-clumping litters produce dust, and both are available in slightly pricier low-dust varieties. Also, sometimes kittens eat their litter or ingest it during grooming, whether or not it clumps. The cat magazine Tiger Tribe ran a story after the introduction of clumping litters suggesting that the clumping action could be dangerous in a small feline belly, possibly causing an intestinal obstruction or other complication. The ASPCA points out no evidence exists to back this concern but suggests waiting until your kitty is 3 or 4 months old before using clumping litter. If your kitty is older and eating her litter, pay a visit to your vet, as it may signal anemia, another nutritional deficiency or other health problems. One definite plus to non-clumping litters for many people is that they're cheaper. It's a tradeoff, of course -- the more convenient the product, the more expensive. The most important consideration, though, is what your fuzzy little buddy prefers. Cats are notoriously picky, after all, and if she won't go to the bathroom in a litter box full of clumping litter, its user-friendliness doesn't matter. However, most kitties prefer clumping litter; it's easier for them, too, to simply push aside unsavory clumps instead of wading through wet litter. Who Manufactures Scoop Away Clumping Cat Litter? Is Clumping Litter OK for Kittens? 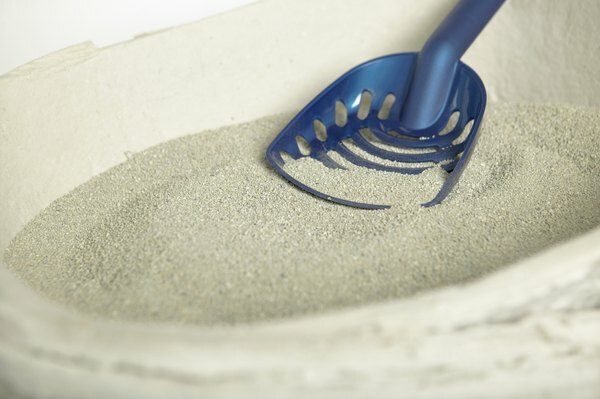 What Is a Healthy Alternative to Clumping Clay Cat Litter?